Is it ever OK to ‘run over’ your child? I heard him a good 10 aisles before I saw him. 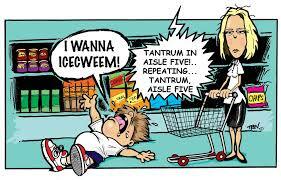 After weaving from the health and beauty section to the vacuum cleaner accessories I met the source of the screams — a towhead of about 3-years-old (maybe a tad younger) slung on his mother’s hip. She balanced the teary-eyed, red-faced youngster while pushing her shopping cart. This entry was posted in Around town on October 1, 2014 by Kristi.